The automated noodle making machine is 'Menderu'. You can make noodles quickly and don't loss flavor. You can make 100% buckwheat noodles. This is the high-performance machine which can make 2000 packs of noodles per hour and which is for customers who provide many noodles. This make making noodles easy. 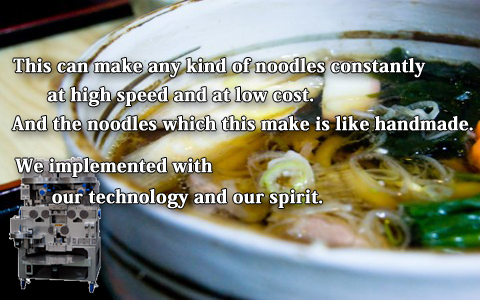 This is the high-performance machine which can make 1000 packs of noodles per hour and which is for customers who provide many noodles. This make making noodles easy. Copyright (C) Mendel Japan Corporation. All Rights Reserved.